Become a high-performing team member to contribute to the Agile Release Train in a SAFe enterprise. 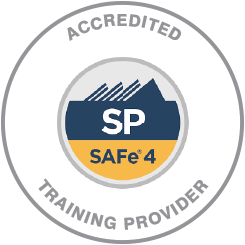 Use SAFe to deliver value and support teams! Want to know how the Agile Release Train (ART) can deliver value? In this course, you will learn the ways to use Scrum, Kanban, and XP to effectively perform your role in an ART. By the end of the course, you will know how to write stories and break down features, plan and execute iterations, and ways to implement Program Increments. There’s also valuable insights into the continuous delivery pipeline and DevOps culture, how to best collaborate with other teams in the program, and ways to continuously improve the ART. TARGET AUDIENCE: This course can be undertaking by anyone interested in SAFe. However, familiarity with Agile concepts and principles, Scrum, Kanban, eXtreme Programming (XP), and/or software and hardware development processes is highly recommended. The examination consists of a closed book, web-based multiple choice exam. Candidates have 90 minutes (1.5 hours) to complete 45 questions, with a score of 35 (78%) required to pass. The exam is free with the purchase of this course.